Issues pertaining to child custody are often the most difficult aspect of any divorce to resolve. There is often a great deal of conflict that occurs in situations where both parents feel very passionately, and finding the best custody arrangement can often be a messy battle. Parents who are awarded sole custody of a child may still be faced with legal issues when it comes to establishing a visitation schedule with their former spouse. Formal legal representation often plays a key role in ensuring that the best arrangements and agreements are able to be made. The safety and welfare of the child is the first and foremost concern when establishing a visitation schedule or shared custody arrangement. Environments that may be less than ideal or parental behaviors that may pose a risk to the child are concerns that need to be addressed promptly and definitively during any divorce proceedings. Legal services are often essential for ensuring that all such matters are able to be addressed, resolved or factored into any visitation or shared custody arrangement. The creation of a pre-established schedule is the most important part of any visitation plan. Determining, conclusively and in advance, which days and times as well as what settings or environments that a former spouse will have access to a child can be a difficult undertaking. While there are some situations that may require strict adherence to a rigid schedule some couples may benefit from a visitation plan that may afford them a greater degree of flexibility. Involving an experienced divorce attorney in the process can provide a range of benefits and help to ensure that the final plan or arrangement is less likely to create problems. 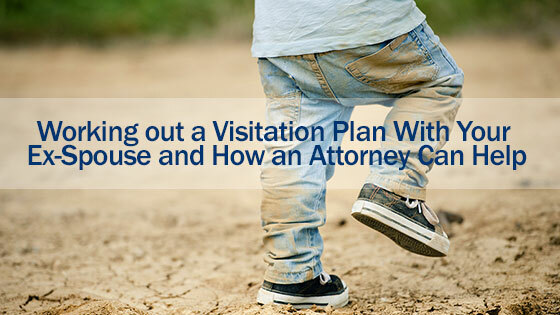 From major holidays to special occasions that no parent would want to miss, there are any number of concerns that a basic visitation schedule may not cover. Other issues that may complicate a custody arrangement in the days ahead, such as having to relocate to a new school district or even to another town, are not concerns that should go overlooked by those who are undergoing a divorce. Legal professionals may be able to identify many areas of a contract, agreement or arrangement that may require further clarification in order to avoid potential complications which may develop over time. The needs of children are never static and it may be possible to outgrow a visitation schedule or custody arrangement. Legal services may prove to be just as crucial for families that are seeking to alter or modify an existing arrangement as they are for couples who are undergoing an initial separation or finalizing their divorce arrangements. Taking a casual attitude to such alterations is a common misstep, especially for individuals who have found it much easier to communicate with the ex over time. Divorce attorney help can protect both parents and children by ensuring that any agreements made will be clearly laid out and legally binding. Dealing with a divorce is never easy, but working with the right attorney can often make a real difference. From child custody to ensuring that financial concerns are able to be resolved more easily and effectively, the services of professional divorce lawyer can often be a critical asset throughout the divorce proceedings and beyond. Seeking out the best law firm and services can be even more important for parents that may have concerns regarding custody arrangements, visitation plans, financial support or any other issue that may impact the health and welfare of their children. What Are Some of the Challenges of Child Custody and Relocation in Texas? Find Out How a Texas Divorce Attorney Can Help.